The Roles and Permissions Basic add-on for Event Espresso allows admins you to create manage and customize the WordPress user roles and give them different permissions with different capabilities so your staff can help you manage your events or the events that other people create. Need to Buy a Support License for the Roles and Permissions Basic Add-on? Download the latest version of the Roles and Permissions Basic add-on for Event Espresso 3 from your Event Espresso account. Install the User-Switching plugin for WordPress to quickly switch between user accounts while setting up permissions. Go to the Event Espresso –> User Roles screen and edit the Administrator role. This role should have all the capabilities checked. Other capabilities such as unfiltered_html, upload_files might be useful if they will be creating event content. If there are capabilities that are not in the list that you’d like to add, they can be entered into the text boxes below the list. 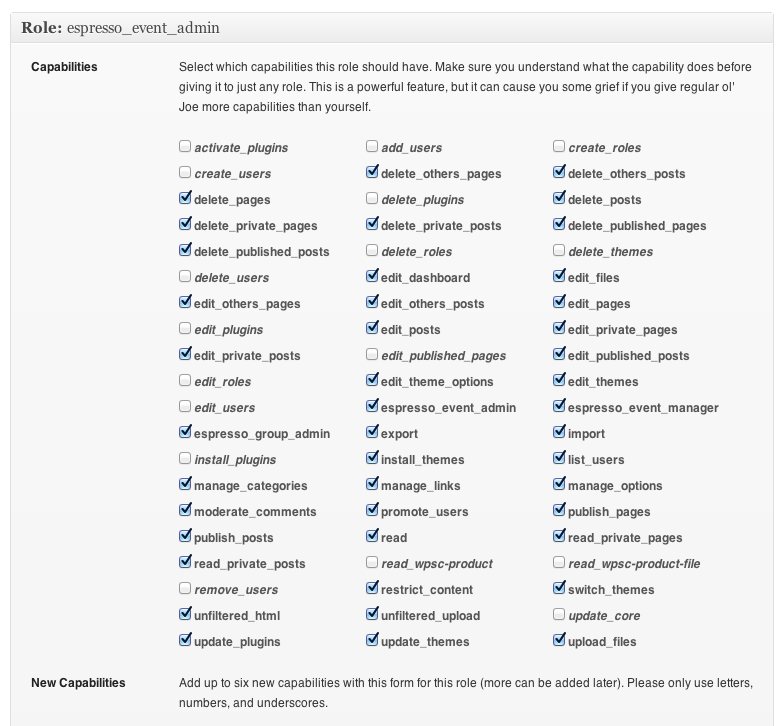 A list of standard WordPress Capabilities can be referenced in the WordPress codex. Then assign this new user role the permissions, or access to Event Espresso features, that this role should have. 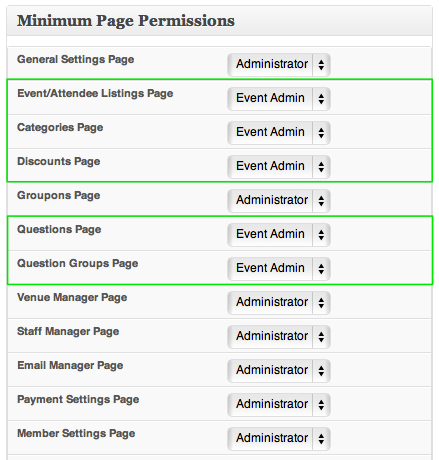 As an example, if the events that the event admin will be publishing will offer discount codes, set the ‘Discounts Page’ permission to be available for the event admin. Be sure to save when finished. The Roles and Permissions add-on “separates” registration form questions and question groups into groups for each user account. What this means is one user will not have access to another user’s custom registration form questions when creating or editing events. The Roles and Permissions Basic add-on is helpful for creating users that have access to certain parts of Event Espresso within your WordPress dashboard. You can assign users certain permissions as shown in the screenshot above. Missing Admin Bar or blocked Admin access when also using Woocommerce? Woocommerce blocks users without the edit_posts cabailbility from seeing the admin bar or accessing the admin.